173010 DKM Daihatsu Marine Propulsion System DKM series Diesel Engines - Main Data, Advantages, Specific NOx emissions, Technical data and Dimensions. Free Download. 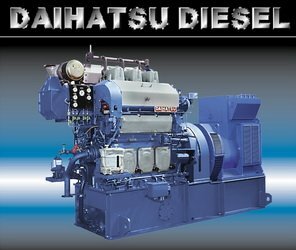 173015 GenSets Daihatsu Marine GenSets (DL-16Ae, DC-17Ae, DK-20e, DK-26e, DK-32Ce, DC-32e, DK-36e, diesel engines) - Output Table, Main Data, Principal Particulars, Dimensions and Weights, Diesel Equipment. Free Download. 173110 3DK-20 DAIHATSU marine diesel Generator 3DK-20 - Spare parts catalog, Maintenance manual, Operation manual. Accessories with spare parts Lists. Additional Information. 173141 8DKM-28 DAIHATSU marine diesel Generator 8DK-28 Spare parts catalog, Maintenance manual, Operation manual. Accessories with spare parts Lists. 173150 8DK-32C DAIHATSU marine diesel Generator 8DK-32C - Spare parts catalog, Maintenance manual, Operation manual. 173210 6DL-19 DAIHATSU marine diesel Generator 6DL-19 - Spare parts catalog, Accessories with spare parts lists. 173215 6DL-20 DAIHATSU marine diesel Generator 6DL-20 - Spare parts catalog, Maintenance & Operation manual. 173220 6DL-22 DAIHATSU diesel 6DL-22 - Spare parts catalog, Maintenance & Operation manual. 173240 6DL-28 Auxiliary Engine Daihatsu 6DL-28 - Operating and Maintenance Manual, Spare Parts Catalog, Technical Information and Service Letters. 173250 6DL-32 DAIHATSU marine diesel Generator 6DL-32 - Spare parts catalog, Maintenance & Operation manual. 173315 DS-32 DAIHATSU engine DS-32 Maintenance and operation manual. 173320 6PS-26 DAIHATSU engine 6PS-26 - Spare parts Catalog, Maintenance and operation manual. 173350 PS-26 DAIHATSU- PS-26 Diesel Engine - Operating & Maintenance.